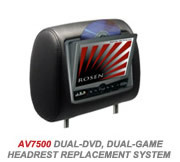 We provide a wide range of Rosen Head Rest Screens. 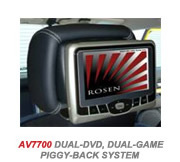 Experience Rosen’s growing options for seat mounted, headrest entertainment systems! Rosen is adding several new options for 2010, including an exciting “Piggy-Back” system for Active Head Restraint equipped vehicles and a “Made-For-Navi” slave screen system for use with Rosen’s growing line of in-dash, multi-media systems with navigation. Each of these system options feature Rosen’s “Best Of Class” LCD technology for crisp, clean video reproduction and off-axis viewing. We have applications for most current vehicle applications. Each system includes 2 matching factory headrests with integrated 7.0″ LCD display, DVD/CD/MP3 drive, 25 video games with wireless game controller, USB port for flashdrive media devices, auxiliary input for external sources, full system controls, 2-way up-down tilt, all-channel FM transmitter to play audio through the vehicles sound system and the ability to add front seat remote controls for each screen, a second auxiliary input for video game consoles, outputs for 2 additional screens and more. This exciting new product features the thinnest complete all-in-one electronics package available today. At only 1-1/2″ thick these entertainment pods include all the same features as the AV7500 Series mentioned above: Integrated 7.0″ LCD display, DVD/CD/MP3 drive, 25 video games with wireless game controller, USB port for flashdrive media devices, auxiliary input for external sources, full system controls, 2-way up-down tilt, all-channel FM transmitter to play audio through the vehicles sound system and the ability to add front seat remote controls for each screen, a second auxiliary input for video game consoles, outputs for 2 additional screens and more. The Patent Pending mounting system, which either mounts to the seat post guides or to the headrest posts, allows the vehicles Active Head Restraint systems to function as designed for ultimate front seat occupant safety in the event of a rear impact collision. While these were initially designed for Mercedes and BMW applications that use a true SRTS triggered Active Head Restraint System, the AV7700 should work for almost any vehicle made. Rosen will have all current colours available and changing from one to another is literally a SNAP. The back cover of each electronics pod can be popped off and the material cover changed quickly. With the rapid growth of Rosen’s exciting line of factory-look in-dash multi-media systems with navigation comes an optional accessory option that is sure to gain momentum quickly. 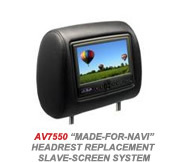 Each Made-For-Navi Headrest System includes 2 matching factory headrests with integrated 7.0″ LCD display, auxiliary input for external sources, navigation system controls for sources such as Radio, SAT Radio, iPod, DVD/CD/MP3 (source select, play-pause controls, radio & SAT radio preset search and more), 2-way up-down tilt, all-channel FM transmitter to play audio through the vehicles sound system and more. This allows the front seat occupants to use their Rosen navigation system and send a DVD movie and more to the rear Made-For-Navi screens.